This is from the diatomaeous earth used in formulating a spray-on textured ceiling. It was found in the course of examining the ceiling material for the presence of asbestos. Silicoflagellates are amoung the group of life forms that make up the phytoplankton. Their cast (seen here) is an opaline silica and they are often encountered in diatomaeous earth deposits. Silicoflagellates tend to be marine, autotrophic flagellates producing their own food through photosynthesis. Many of the species are very sensitive to temperature and so become important indicators of paleoclimates in fossil deposits. 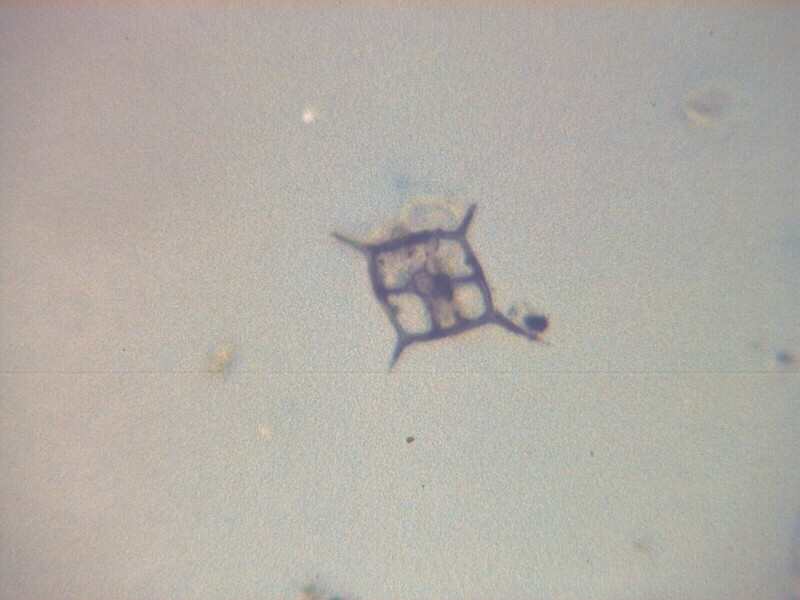 Silicoflagellates are characterized by a basal ring with extending spines. Some species have elaborate domes extending from one surface of the basal ring, which results in a hemispherical asymmetry. They are typically 20 to 50 micrometers in diameter but some may be as large at 100 micrometers. The structure is isotropic silica and so is dark between crossed polarizing filters. The Distephanus genus has a apical (central) window.